FAQ:How can I safely remove gummed stamps from paper? Every new stamp collector is faced with the dilemma of acquiring stamps for his collection. 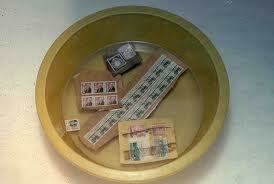 Many have chosen to collect used stamps, often an economical alternative to mint stamps. However, when used stamps are on-paper (for example:still stuck to an envelope) how do you get the stamps off without damaging them? You have to soak them. Here’s hoping this article will help you to proceed in the best possible way. Two small plastic tubs-It is better to use a small tub or container to soak your stamps rather than doing it in a sink since you risk losing a stamp down the drain if the drain release is accidentally pushed. One tub is filled with warm water for the soak, the other with cool water for the rinse. Scissors-You need scissors to trim the paper around your stamps. Stamp tongs-It is better to use stamp tongs to handle the wet stamps, that way you don’t get gooey fingerprints on them. Also, make sure you use genuine stamp tongs and not any old kind of tweezer. Tweezers generally have ridged grooves on the inside which could damage your stamps. Stamp remover liquid-This is only necessary if you are afraid your stamps have ink which might run. This liquid is also handy when you have a clump of stamps all stuck together since it can unstick them instantly. Otherwise, in normal circumstances water is just fine. You need to separate your stamps one from another. If you have older, fragile stamps that are highly coloured with greens, reds, or blues, it’s good to soak them one at a time since the ink might run onto a neighbouring stamp in the tub. In general, the ink on modern stamps doesn’t run. Trim the paper around your stamp. Allow a one inch border so that you don’t accidentally nick the actual stamp. Note of caution: make sure you are not cutting a stamp off of a first day cover! You should be able to see your stamps lifting off the paper. If a stamp is still sticking to the paper a little bit, you can swish it around gently with your tongs to loosen it more. Worse comes to worse, just let it soak a little longer. Remove the stamps from the water by gripping the paper with your fingers and gently lifting the stamp off with your tongs. Be careful! Wet stamps are fragile! If the stamps have unstuck completely in the water just lift them out with your tongs. You can rinse them in the cool water tub to make sure you get all the gum off. Let your stamps dry (face side down) on a paper towel (preferably untextured so it leaves no pattern on your stamp) or absorbent blotting paper. If you like, you can use stamp drying books, but all they are is blotting paper in a bound volume. When the stamps are almost dry, cover them with another paper and weigh them down with a heavy book so that they will flatten. Careful! Make sure you have no curled edges before weighing them down. And that’s it! Hopefully you will be successful. Let us know if you have any other suggestions or questions. Happy soaking! We inherited old Canadian and USA stamps. Some are still on envelopes but are ready to fall off. We were told that they have to left on the envelope to be worth anything, however, I just read that they have to be taken off. Please confirm. Also what should we do now? Is there a sit where I can get values as there is no place where I can take they in our area. Thank you for any help you can give us.